Nothing like our Malaysian sugar and sweet delight. A big yes from me personally of course (Pumpkin Sago Dessert, Malaysian Sago Pudding, Kuih Buah Melaka & Bingka Pisang). Not to say I am anti Western desserts, but by far the joy is forever Malaysia made desserts, aka kuih-muih and I might as well include other close to us Asian desserts (Thai Mango Sticky Rice) though so little from other Asian continent I have made. Perhaps who knows in the near future? Maybe. Today, the dessert card I have drawn is this Wajik Pulut (Sweet Glutinous Rice Cakes). Nevertheless, not the traditional or typical one like those made by my mum. Those stirred for almost hours and really heavy sugar loading. I on the other hand decided I can limit the amount of sugar and who said you can't? Not me, lemme repeat myself again. Oh please! Gone are the days we think unless we go heavy on sugar, our Malaysian desserts will not turn out to be as expected. Not so true. Look at this Wajik Pulut. Says it all right? Made within like an hour and without my arms breaking into two. Ingredients for Wajik Pulut? 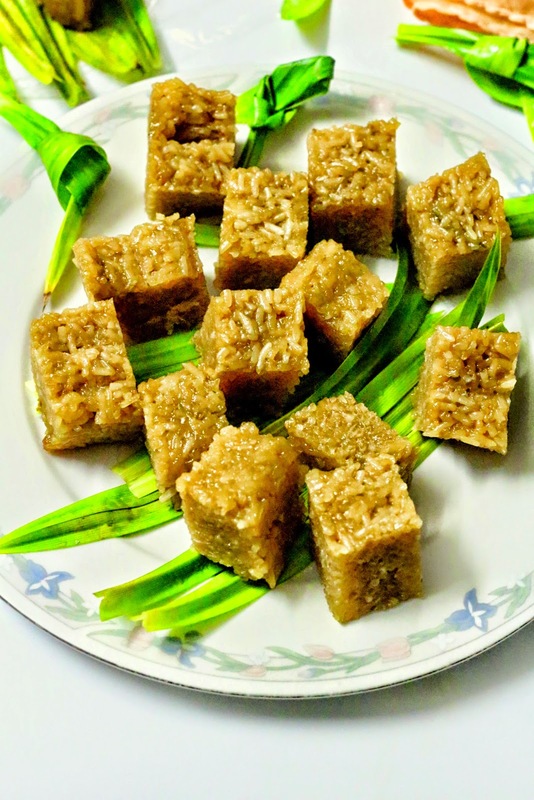 Obviously, glutinous rice which you have to prior steam and later, tipped into the palm sugar, coconut milk and pandan leaves syrup and stirred till you obtain a thick rice mixture. Thereafter, tipping mixture in a tray before spreading evenly. Wajik Pulut? Sedap! Deliciousness! Hail our this, one of it as part of our kuih-muih/local delicacies. Soak rice overnight. Better so that you can save time on steaming it. 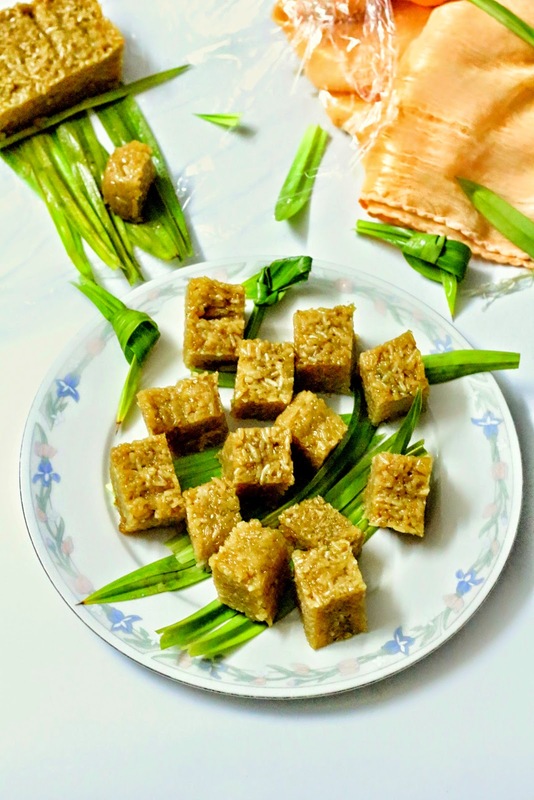 Pour coconut milk in a large work/pan, add palm sugar and a few pandan leaves knotted together. Simmer and keep stirring for the outcome of a thick syrup. Add steamed rice and stir, till all these ingredients comes together. Still slightly wet in texture though, but really thick. 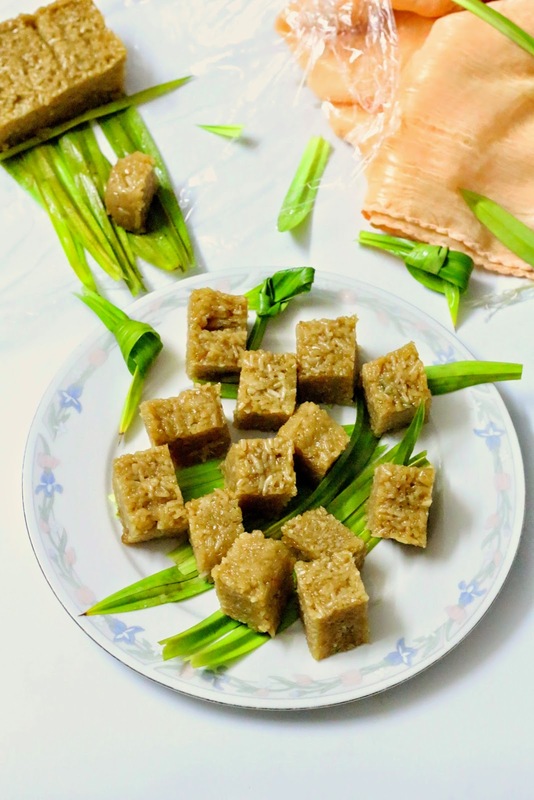 Meanwhile, line a pan pan with pandan leaves (this is optional, only if you want to). Tip rice mixture into pan and spread evenly. Let it cool down and cut into pieces. Rice cake looks delicious. Going to buy pandan leaves asap. New & innovative rice recipe................looks awesome.love to try this. Nava, I'm new to this sweet treat! Is this Chinese or Indian dessert? Very interesting! The cakes look fabulous! I went through the ingredients and I know I'll love the taste! Tempting pic..sweet rice cake looks delish. Oh the cake looks fabulous .I am not sure i get screwpine leaves here ,Can i use any other leaves instead? I have not tried this before. The rice cakes look so delicious! WOW! Your recipes are always interesting and delicious!